The marshlands of the Thames estuary are bleak and exotic landscapes which allow your imagination and megalomania to flourish. Dickens evoked their haunting beauty of big horizons, sky, water, mud and wilderness most vividly. Proximity to London is largely illusory; the water is a barrier more than an artery and this is a different, hidden world and a very different dimension from the metropolis. But its emptiness and isolation provided a blank canvas for big kit and the twentieth century transformed estuarine outer London into a ragged industrial landscape: factories, refineries, power stations, sewage treatment works, mineral extraction. They are not beautiful but the heroic scale of the ventures and the ambition with which they were accomplished impresses. But in the neo-liberal age of manufacturing decline much of the infrastructure became redundant, leaving big brownfield sites, conveniently out of view for the ruling and chattering classes, and therefore highly suitable for redevelopment, at least in theory. With the glittering precedent of Docklands regeneration, it seemed obvious to extrapolate regeneration to ultimate fantasies – a Thames Gateway linear new town to deflect development from nimby constituencies and a new mega-hub airport to expand London’s continental hegemony whilst only disturbing seabirds and bankrupting the Treasury. Neither of these were new concepts. 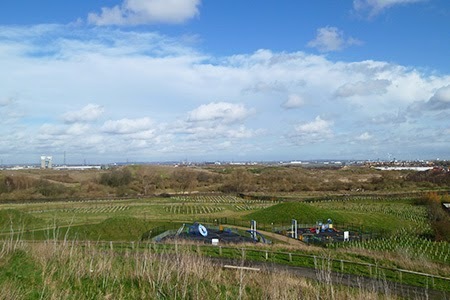 The Woolwich-Erith marshes, formerly part of the huge Woolwich Arsenal installation, were designated in the 1960s as what was effectively the new town of Thamesmead. For Boris’s super-hub airport read Foulness, whose very name helped scupper plans to put London’s third airport on the Essex marshes in the 1970s. The then Michael Heseltine flew over the estuary to view the proposed airport sites and saw vast swathes of derelict docklands and contaminated ex-industrial land. When he became Secretary of State for the Environment he quickly established the London Docklands Development Corporation. Heseltine was cute enough to side step ‘the romantic view of what the market would achieve in such an area when left to its own devices’ (I think we know who he was thinking about). His face saving formula was to pour public money into infrastructure and site development but to give private developers control over the built environment, let them keep the profits of enhanced values and to credit ‘success‘ to the virtues of free market enterprise. And as we know Canary Wharf was such a success it was the poster for Thatcherite Britain in all its tawdryness and self serving delusion. So obviously you roll out this model along the estuary all the way to Southend and Sittingbourne, right? 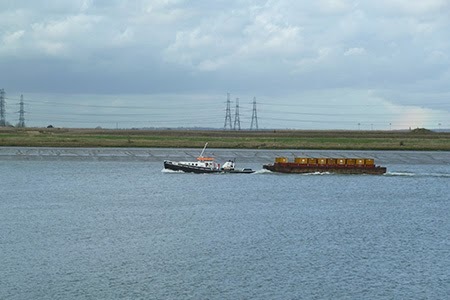 The Blair government set up the London Thames Gateway Development Corporation in 2004, which quickly sank into the mud of its lack of realism. It was a bonkers concept without clear focus and priorities, reliant on the co-operation and good will of the development industry which surprisingly was not forthcoming. The LTGDC folded in 2012, but nobody much noticed. Now the Centre for London has published a new report ‘Go East; Unlocking the potential of the Thames Estuary’. 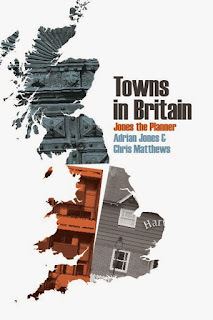 It is authored by luminaries such as grands projects junkie Lord Adonis and the veteran planner Sir Peter Hall (always good value), with an introduction by veteran and unrepentant Bourbon Lord Heseltine. There is good analysis of what went wrong with the Thames Gateway and somewhat less convincing proposals for how to go forward with a rebranded ‘East Thames’ development strategy. It proposes ‘new towns’ at Ebbsfleet, Barking Reach and Thurrock and a Disneyland at Swanscombe. The recommendation to reinvent the proactive development corporation model as used at Milton Keynes however is sensible. MK is now seen as the great success story although urbanists might disagree. Like Milton Keynes, Thamesmead was a Mk2 new town, a hugely ambitious project but one of the newly established GLC not the government. It is not generally seen as a success. Thamesmead was expected to have a population of 100,000 with all the amenities of a town but these were not forthcoming. Crucially, the projected Fleet underground line from the West End and City to Thamesmead was abandoned in 1979, so the town was always peripheral to London. 40 years late Crossrail will soon open to Abbey Wood on the edge of Thamesmead, dramatically transforming its accessibility with huge implications. Buy, buy, buy – (relatively) cheap houses and fast trains; the gentrification monitor is likely to go off the top of the scale. 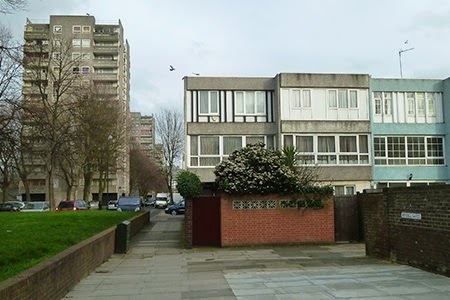 This is especially so for the early phases of Thamesmead (close to Abbey Wood) with their modernist chic of striking sculptural rectilinear blocks and what could be attractive squares. Following the usual trajectory there were high expectations for Thamesmead the futuristic city, initially viewed through the prism of the slum conditions and overcrowding of inner London. But as with so many supremely self confident large scale public housing projects of the 1960s, poor maintenance, lack of the promised new town facilities and its poor transport connections soon took the shine off the vision. 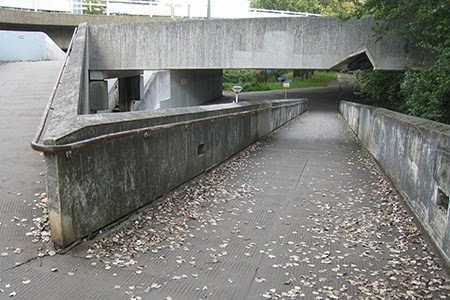 Filming Kubrick’s Clockwork Orange there sealed Thamesmead’s fate in popular and media perception and it was thereafter stigmatised as a concrete disaster, a sink estate. But what is interesting about Thamesmead is how well it illustrates the progress of housing development from utopian modernism through municipal attempts at more traditional interpretations of Merrie England (but in a social housing context) to big builder cynicism and incompetence and the death of Buildings for Life. Pending the completion of Crossrail we arrived at Woolwich Arsenal via DLR. Since our last visit Woolwich has acquired the mother of all god awful Tescotowns, the largest in Europe with over 900 apartments stacked above. Designed by Sheppard Robson it is gross in its concept and bulk and sleekly indifferent in execution, showing utter contempt for its neighbour, Pugin’s St Peter’s church, which now faces a fine composition of ventilation grills and service entrances beneath a cliff of vile, garish green and yellow cladding. I’m not sure if this is the kind of ‘sod you’ architecture we are now told to admire but what it seems to be missing is the now rehabilitated Owen Luder’s ‘this is what I think’ bit. Its companion, also of vast scale, is the new Greenwich town hall on Wellington Street designed by HLM and cited in the Carbuncle Cup as ‘spectacularly awful’, which is a bit harsh. Perhaps this bad press accounts for the security staff telling me I could not photograph the building even from the street. The scenic walk to Thamesmead starts via the Royal Arsenal development where apartment blocks are shooting out of the ground next to the Crossrail station. Berkeley Homes announce that ‘in the last five years we have invested £260million in the facilities communities need’, which is awfully nice of them. Overall the scale, grandeur and order of the retained Arsenal buildings provides framework and restraint for new development; it is only when you get to the Thames that the monoculture of vacuous apartment blocks takes control, all sullenly fenced off from the waterside ‘public realm’. However the battery of apartment blocks across the river look even cheaper and nastier. Beyond the derelict and fenced off lock of the Broadwater canal you enter Thamesmead, or rather Thamesmead West. The reality is that the ‘new town’ has very little urban integrity, being broken up by megalomaniac roads and the substantial physical barriers of tips, watercourses and Bazalgette’s massive outfall sewer. Away from the river the housing immediately becomes about as Noddy as you can get and it is hard to imagine you are still in London. 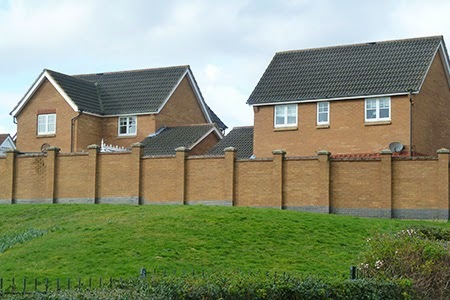 In later phases development slightly recovers its balls, at least in scale and crudity, no longer trying to be twee and indeed the new barracks ‘communities’ are gated as effectively as Stalag 17. The token Ecopark estate is bizarrely laid out around a huge car park. 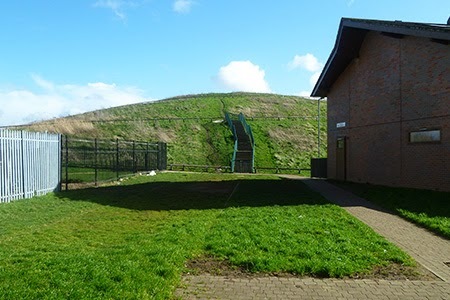 Behind this is the unsettling mound of the Tor which you can ascend to get a fairly spectacular overview of development and dereliction. You survey a vast prospect of contaminated tips some of which is being reclaimed as parkland and nature reserves. You can imagine the whole area as a fantastic new park, as wonderful as the Royal Parks and a great new asset for London. But where would such vision and patronage come from these days? The best we can hope for is the condescension of ‘planning gain’ on the back of some fat cat asset stripping. And there is another problem – the East London River Crossing. There is no road bridge or tunnel between Blackwall and Dartford and even to me the case for a new crossing linking Thamesmead with Becton seems pretty overwhelming. But as with the Fleet line, the bridge plans have been scrapped, first in 1993 and then by Boris in 2008 – surprising for a Mayor who gets off on big infrastructure gigs and is happy to invest £30m in Joanna Lumley’s absurd garden bridge. The Go East gang are big on reviving the East London bridge whose motorway access will slice across the current wasteland. Can you see Joanna Lumley from here? Parkland potential. Then there is the projected ‘Tamesis Point’ development on a large tranche of the tips east of the new road. This is promoted as ‘the last piece in the jigsaw of Thamesmead which will be dramatically different from other development in the area’ according to Tilfen Ltd who acquired the assets of the defunct Thamesmead Town. Outline planning permission has been granted for this 25ha development of 2,000 homes with a mile long riverside esplanade of vibrant uses to a masterplan drawn up by David Lock Associates and adopted as SPG by Greenwich in 2003. Certainly this is as grand an essay in Beaux Arts planning as you are likely to see from the air, allegedly taking inspiration from the Paragon at Blackheath and evoking London squares if you can suspend your disbelief, which I can’t. Anyway it has not happened yet. The walk along the Thames path is almost rural with god knows what behind the high duty galvanised security fencing. Eventually you reach earlier attempts at an esplanade, with quite striking rusting ironwork art and concrete bunkers. Looking back across a lake you see Thamesmead Centre. Originally conceived as something like Cumbernauld, it ended up as a whimper, a rather charming toy town vernacular precinct with whimsical clock tower and a stepped plaza down to a watercourse. 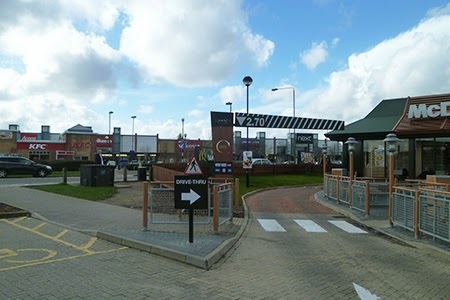 The few shops look downbeat as well they might as the action has moved to the vast adjacent retail park with its dismal brick dressed Morrisons, tin retail sheds and loathsome drive thru artery blockers all around an ocean of car parking. There is a nondescript leisure centre nearby and a health centre (both much needed given Macdonalds and Colonel Sanders) but for a town of maybe 50,000 people this is just a miserable excuse for a town centre. The housing of Thamesmead North continues this theme of loss of confidence and lowest common denominator. Some of the houses are more up market with a dash of Surrey exec and a rash of Edwardiana flats (in marketing concept, not execution). The Thames path is pleasant, looking across to a hauntingly desolate Essex marsh where electricity pylons emphasise its horizontality. But generally the new housing is just so dire it should win prizes. It lays bare the futility of hopes for better housing and place-making invested in By Design, Manual for Streets, Places for People and similar positive tracts of the Cabe era, when there was a batsqueak of optimism for the future. The plan is worse than the house designs, endless disorientating looping roads and culs-de-sac; thank god for mobile phone satellite maps or I’d still be out there. Everything is designed around car parking; a Tony Robinson of the future will definitely conclude we worshipped the car and he or she would be right. Pedestrians certainly don’t get a look in. Sod it, can't be bothered to join up the paths, just take the money and clear off. The formlessness and timidity of Thamesmead’s recent development epoch could not be more different from the boldness of the original vision and the linear clarity of early phases of building. To appreciate how this early development evolved you are best to approach from Abbey Park station via the magnificent Lesnes Park with its Abbey ruins. From here an elevated concrete pedestrian walkway takes you from south east London suburbia to a new world as imagined in 1967. The concept was of linear blocks with raised pedestrian walkways, creating a coherent and very urban framework within a landscape of lakes and greenery. 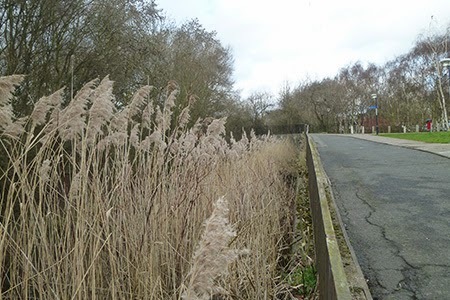 The lakes and watercourses are one of the most distinctive features of Thamesmead and both are essential, for this is a marsh. They provide a strong aesthetic counterpoint to the uncompromising linearity of the housing blocks. The upper level walkways were a requirement because of flooding (the area was inundated in the great flood of 1953, so they really made sense). 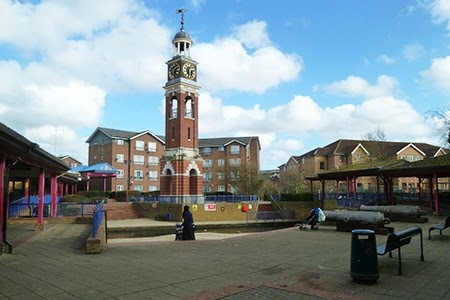 Parkview, closest to Lesnes Park, was the second phase of development begun in 1969. It incorporates the same elements of spine block, lower terraces and point blocks as the first phase, Lakeside, but has a simpler and more relaxed layout around larger space. Tasty refurbished concrete. If only the 90s was about this. Lakeside is denser, more complex and visually dramatic. 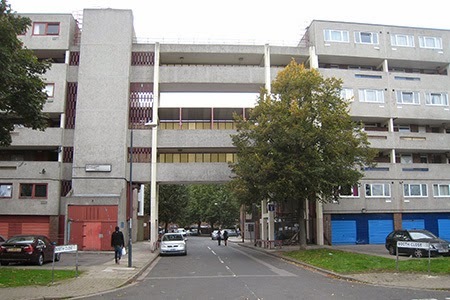 The upper level walkways with parking and many internal garages at ground level makes for some awkward spaces and relationships but this is not the fetishised separation of traffic and pedestrians which caused such complications in later Radburn estates. 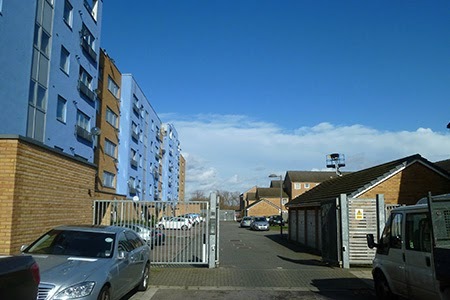 Industrialised building was the big idea of the age and these early phases of Thamesmead used the French Balency system but prefabrication was not a success: the process was too complicated and expensive so it was abandoned in later phases. The pale concrete slab construction with wood frames still looks pretty good although purists will hate the ad hoc DIY additions and alterations of right-to-buy owners. 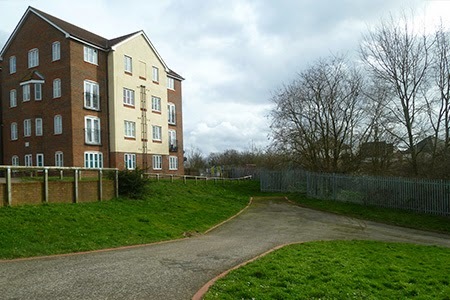 The crudity of much of the repair and renovation work by the Gallions Housing Association (which took over the public housing stock from the GLC) is also a disappointment. Recently some improvements to point blocks have been done with sympathy and just a whisper of De Stijl but more substantive make-overs of lower blocks completely destroy the original ethic. How long before the hipsters move in? 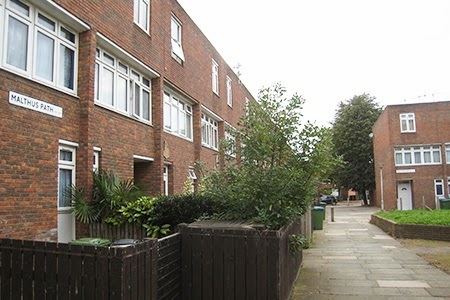 It is interesting to see how the flats and terraces have been adapted by residents, almost invariably to try and evoke a cosier look and to reinforce private space. However the likely gentrification following the arrival of Crossrail will almost certainly take things in an opposite direction, celebrating the modernist sparseness and clarity. It is easy to see how this could become very desirable territory; in places it evokes Bloomsbury squares and the setting of South Mere lake is stunning. 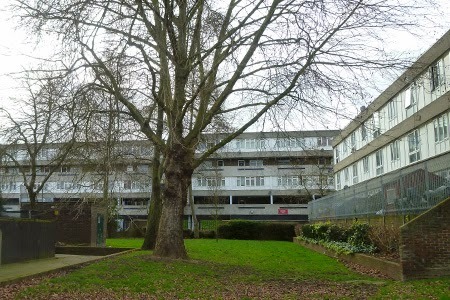 But this of course places the value of architectural style above the evils of social cleansing. Thamesmead remains for the time being a working class redoubt. The rest of Tavy Bridge has also been demolished as part of the ‘regeneration’ of Thamesmead by Gallions Housing Association. 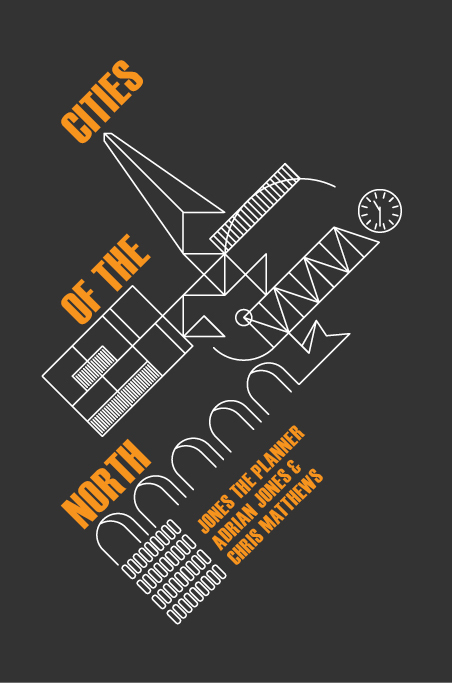 The rationale is full of clichés about concrete, planners’ dreams (sic) and failure. Incredibly Clockwork Orange is presented as evidence of this failure; it was a film for god’s sake. The mendacious images of the new development, renamed Southmere village, show stark blocks and towers in what could be concrete but is probably render foiled by beautiful formal gardens in the foreground, sun glistening on the water, swans preening, bluebirds singing. Strangely there are few happy, smiling people. I don’t buy the vision but history is written by the winners. South Mere is very impressive, large enough for sailing and there is an attractive boat club (1977) at the far end. 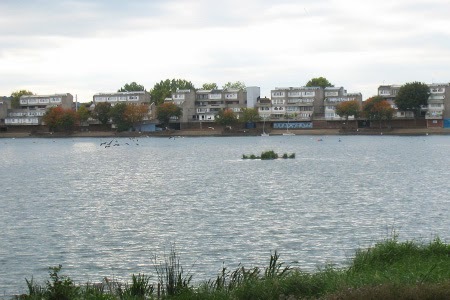 The lake provides a fine context for the point blocks of the original new town, and with the three storey terraces and the extensive park in this part of Thamesmead it looks as though the planners’ vision was actually realised. There is cinematic evidence too: the 1996 film Beautiful Thing depicts not a dystopian Thamesmead but a lush, exotic setting for a love story, helped by an overwhelming soundtrack of Mama Cass. However the Southern Outfall Sewer is the effective boundary of such dreams. 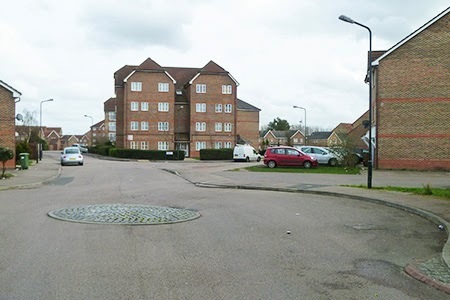 Together with Eastern Way this cuts Thamesmead in two and you have to be determined to cross it. 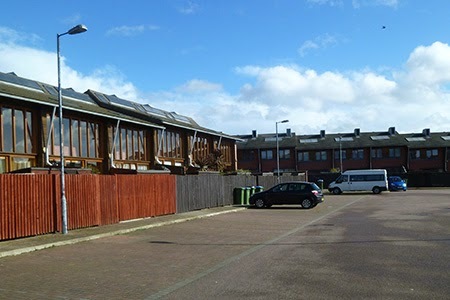 North of Eastern Way is the third phase of the new town built 1972-77 and called The Moorings for no very evident reason. Here the perimeter block along Carlyle Road becomes a grim barracks which is hard to like but the lower blocks behind, faced in brick, sober and well proportioned are much more successful. There are some nice details like the metalwork panels but the community centre in the middle besieged by razor wire and CCTV tells a depressing story. Possibly an ironic joke is that the streets are called after social reformers: Attlee Road, Bentham Road, Booth Close, Tawney Avenue, Titmuss Avenue etc. There is also Malthus Path. After The Moorings the original conception of the new town was replaced by attempts at lower density rus in urbe social housing around Radburn layouts, but it is hard to identify any really successful examples. Things went downhill quickly after the assassination of the GLC in 1986, with big builders’ standard dross becoming the norm, eventually giving way to Blair and now Osborne bombast, as we see at Tavy Bridge. 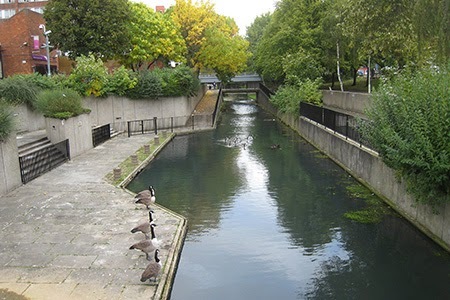 The extensive watercourses of the area provided a basis for a network of green paths which are very attractive and one of the big successes of Thamesmead. From The Moorings one such route takes you west through the remains of the massive walls of the Arsenal beyond which is what was Waterfield School. This was designed in 1975 and described in Pevsner as ‘like a sleek and glossy high tech factory’. 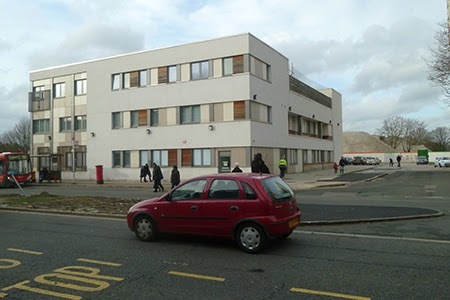 Now the Woolwich Polytechnic School, it appears somewhat altered but still with a clear influence of Hunstanton. Of course security makes it pretty impossible to photograph schools these days, but on Yarnton Way the Bexley Business Academy by Foster is worth looking at. He also built the Modern Art Glass warehouse deep in the Eastern Industrial District. It is difficult to leave Thamesmead without a sense of disappointment. Clearly, the visionary concept was flawed but it honestly expressed social purpose and optimism for the future. Most of what we see today suggests tawdry short termism and self serving hype. Thamesmead was unlucky it was not a government designated new town, as with an autonomous development corporation it might have had more of a chance. It is divided administratively between Greenwich and Bexley and is entirely peripheral to both. Thamesmead seems like a place that has things done to it, mostly by the ubiquitous Tilfen Ltd and Gallions Housing Association. 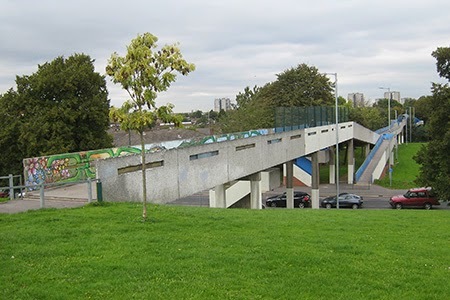 Who is responsible for Thamesmead and why is it such a neglected place? 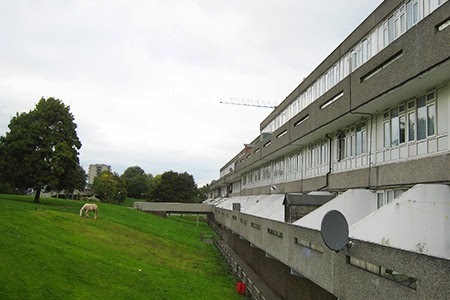 Wild horses roam as in the wild Dublin estate of Into the West (the one with the horse in the lift). Litter is strewn without hope of collection, the toilets in the town centre are ….. disgusting. And this is London, global city blah, blah, blah. 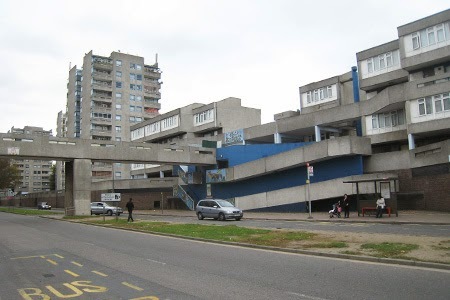 If localism meant anything it would mean places like Thamesmead controlled their own affairs and had the power and resources to sort out their own problems and to realise their own opportunities. The town would control its land and assets for the public benefit just like the garden cities the government are so fond off (apart from the last bit). But despite all the rhetoric froth I don’t see this happening to Thamesmead. Thanks to Owen Hatherley and Douglas Murphy for the guided tour. 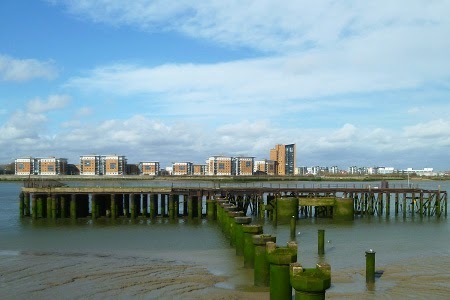 Owen’s Guide to the New Ruins of Great Britain contains an extensive analysis of Thamesmead in the Greenwich chapter. Oh God. All my efforts now boxed up into the "CABE era"
Excellent overview of Thamesmead. One minor point - Southmere is a one-word named lake according to signs around the area. Found you via a referral to my blog, glad to see the interest in the area. Whether the hipsters will land is partially dependent on how many banks will loan mortgages on the concrete properties - most of them are listed as cash buyers only when they come up for sale. I bought a 4 bed in 2009 that was advertised for 160k, they dropped as low as 130k last year, but seem to be around 175 right now - I suspect the Crossrail effect is taking hold already. The cash buyer problem means that a lot are purchased as buy to lets, and a good number of tenants are on housing benefit right now. I expect the rental market could well improve when the line is open but that's not until the end of 2018. 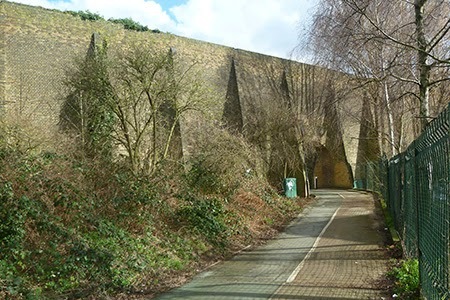 Please see my website http://www.royal-arsenal-history.com/ relating to the "old military history still visible" there is a Thamesmead menu also. 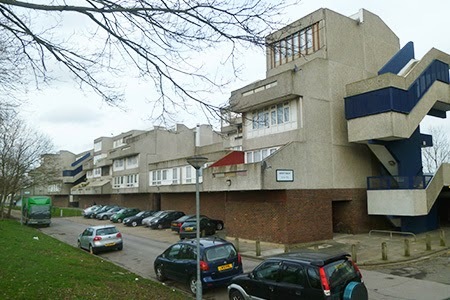 Please see Thamesmead group https://www.facebook.com/groups/ThamesmeadSE28/ for 2 years worth of input from the local community, many members on here are originals from the 1970's. Also regarding the moorings, "community centre in the middle besieged by razor wire and CCTV tells a depressing story" are you referring to the youth club next to Hawksmoor School? Thanks Steve, the blog is very interesting. The community centre is in the green area behind Attlee Road as I recall. 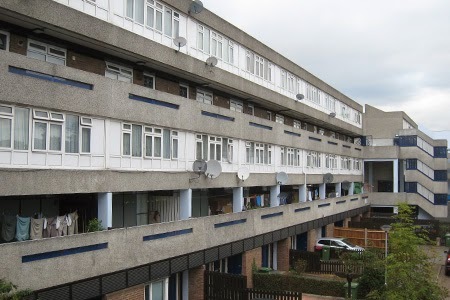 How can anyone not appreciate Thamesmead itself in comparison to the subtopian Thamesmead North housing? Don't know if you've seen this: http://www.youareelectric.com/2013/06/02/original-plans-and-images-from-the-thamesmead-housing-development-in-london/ ? Those were the days (again). No-one has any right to tell you that you cannot take a photograph of a building from the public street. An excellent article, many thanks. 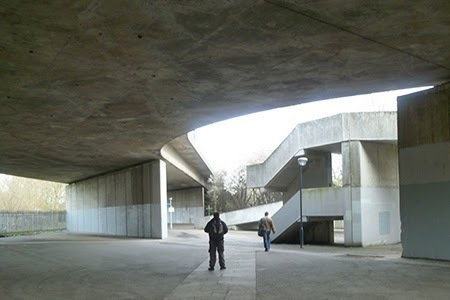 Excellent as always - I have always wanted to visit Thamesmead, and will do. Always amazed that the way a lot of development in London infringes access to walk along the Thames. 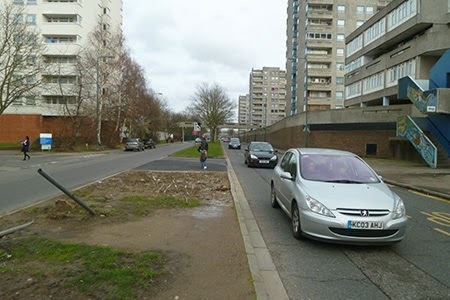 This blog really highlights the importance of access and walkability - water and greenery too - as the foundation of successful places, leaving aside whether you love or hate the original Thamesmead buildings (I love them). I live in Edinburgh and have always wondered if Cumbernauld had been built much closer to Edin/Glasgow if the young family/hipster effect would have kicked in. Just discovered this blog mr.Jones and I'm hooked already. You're exploring all the provincial British towns my parents have failed to introduce me to on the basis that they are 'ugly' or 'midlandsy'. This I attribute to their contempt for anything architectural post 1900 and anywhere with an industrial heritage. Now though I can explore 'nowheresville' without the snearing critique. whether the Modernist architecture will be enough to encourage gentrification? 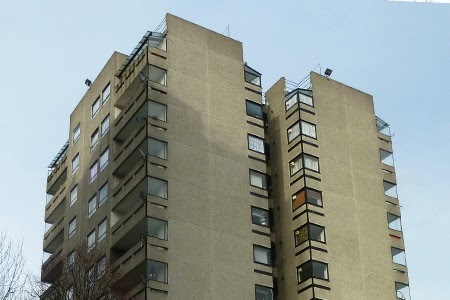 From what I can see people are still reluctant to move into these modernist flats while we remain a house based society. Is there anywhere in particular outside of London (or the southwest) that you've noticed is becoming more gentrified and trendy without government or local planning? Hi Tom, glad you find the blog interesting. The obvious cities outside London which are gentrifying are Oxford and Cambridge, although this is very much the result of indirect government subsidy - both have about the highest proportion of public sector jobs in Britain. Then both Edinburgh and Cardiff, but largely through government patronage in the wider sense. Other historic cities like York also successful and then some of the smaller cathedral cities seem to do well, like Lincoln and Exeter in my blog. Small places like Oakham in Rutland, Burnham Market in Norfolk, Southwold in Suffolk exude gentrification. So strong correlation with 'heritage' and the wealthy. Within big cities trendy suburbs increasingly diverge like Didsbury in Manchester, Headingley in Leeds, West Bridgford in Nottingham, Clarendon Park in Leicester for example. All examples of spatial impact of this country's extreme inequality.